Located just on the Limb (obviously, only from our point of view) of the so-called "Dwarf Planet" 1-Ceres, at about 7 o'clock of 1-Ceres' (highly uneven) disk, we can see - once again - the large Flat-Topped Mountain - about 3 miles (such as approx. 4,82802 Km) high, surrounded by (relatively) smooth Terrain - that we have already shown you in yesterday's APOD. Probably it is useless to say - but it is a good thing, in our opinion, as IPF, to underline this specific circumstance - the so-called Emission Angle here is very high. The "new" White Spot, as well as the white Material that we have noticed still in yesterday's APOD, are also clearly visible here, in this picture. 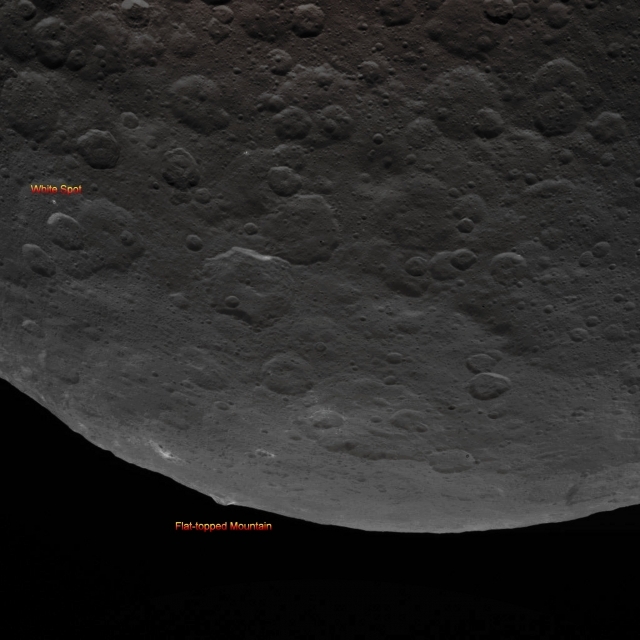 As we have already said in the past, also this specific frame is just one among the first snapshots coming from Dawn's second Mapping Orbit of 1-Ceres, which is carried out from an altitude of approx. 2700 miles (such as about 4345,218 Km). Even in this case, the Resolution is roughly 1400 feet (such as approx. 426,72 meters) per pixel. The image (which is an Original NASA - Dawn Spacecraft's b/w and NON Map-Projected frame published on the NASA - Planetary Photojournal with the ID n. PIA 19587 - Dawn Survey Orbit Image 19) has been additionally processed, magnified to aid the visibility of the details, contrast enhanced and sharpened, Gamma corrected and then colorized (according to an educated guess carried out by Dr Paolo C. Fienga-LXTT-IPF) in Absolute Natural Colors (such as the colors that a normal human eye would actually perceive if someone were onboard the NASA - Dawn Spacecraft and then looked ahead, towards the Limb and Surface of 1-Ceres), by using an original technique created - and, in time, dramatically improved - by the Lunar Explorer Italia Team.